Rule #1: Cardio. We evolved to run and keep moving. 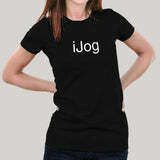 Proudly sport your iJog t-shirt when you jog or just to brag that you jog. Oh and yeah, swimming and cycling is for sissies. So run like you have a creepy man behind you and a hot guy/girl is in front of you.